These gorgeous Gingerbread Chocolate Brownies are the perfect Christmas dessert. 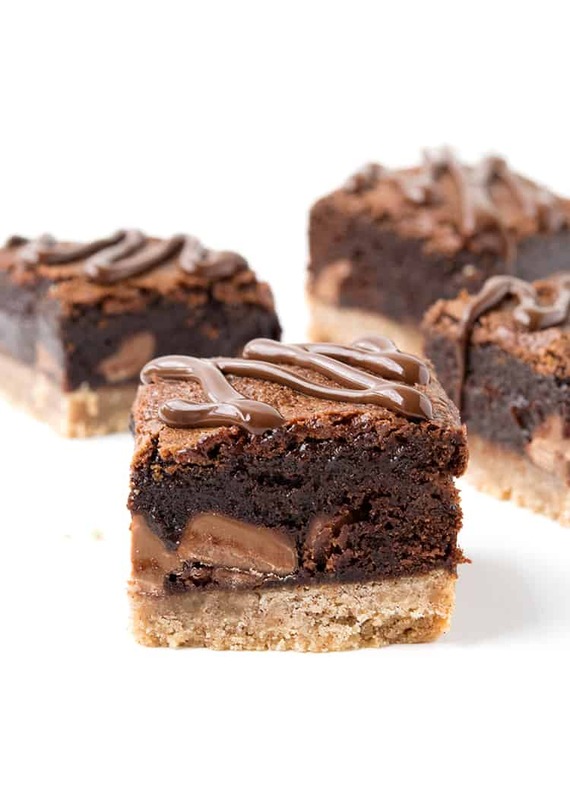 A homemade gingerbread cookie crust topped with a fudgy chocolate brownie, drizzle with melted chocolate. When two loves collide, you end up with a mouthwatering two-in-one treat, like this one. 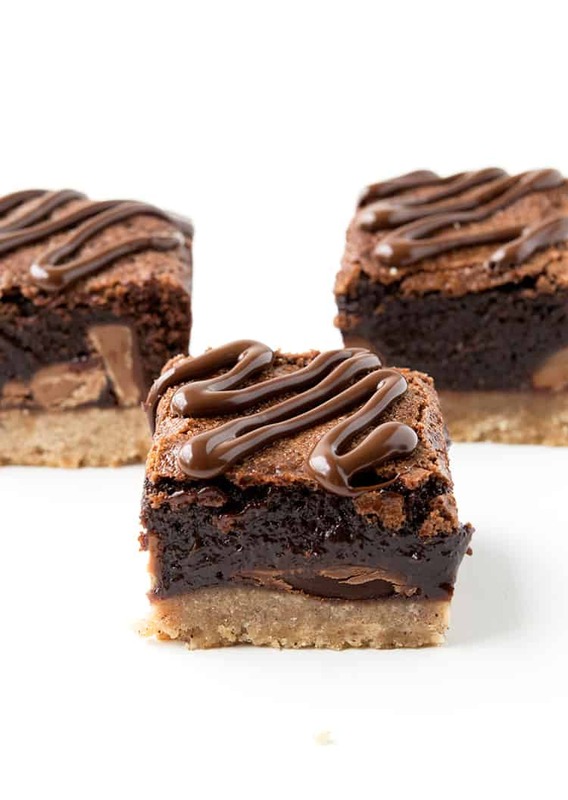 A crumbly spiced gingerbread cookie crust, topped with a gooey chocolate brownie, all finished with the perfect chocolate drizzle. I mentioned last week when I shared my Nutella Stuffed Chocolate Chip Cookie Bars, that I’ve been having major gingerbread cravings. I don’t know about you but I love gingerbread. And I go without it all year, so by the time Christmas rolls around, I’m so ready to indulge in ALL the gingerbread things. Honestly, there is nothing better than a homemade, spiced gingerbread cookie. If a chocolate brownie and a gingerbread cookie got married and had a baby, this is what it would look like. 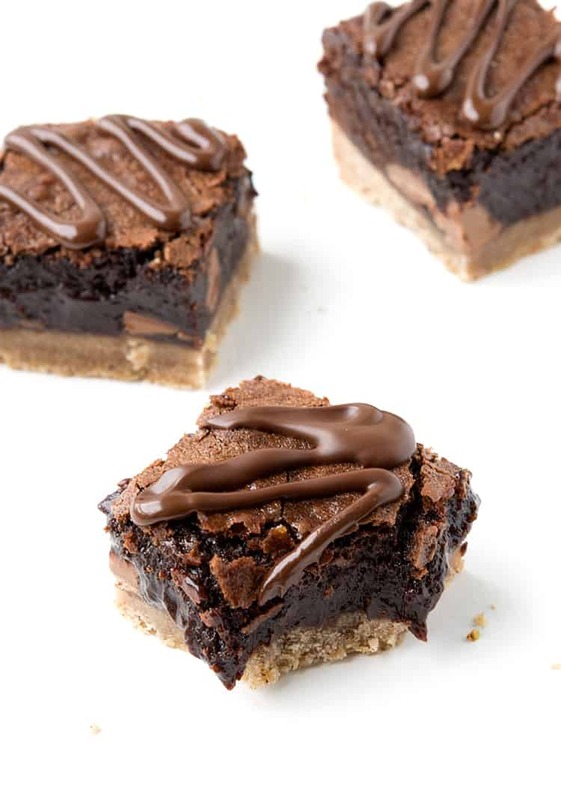 A spectacularly gooey brownie sitting atop a crumbly gingerbread cookie. I can’t even. 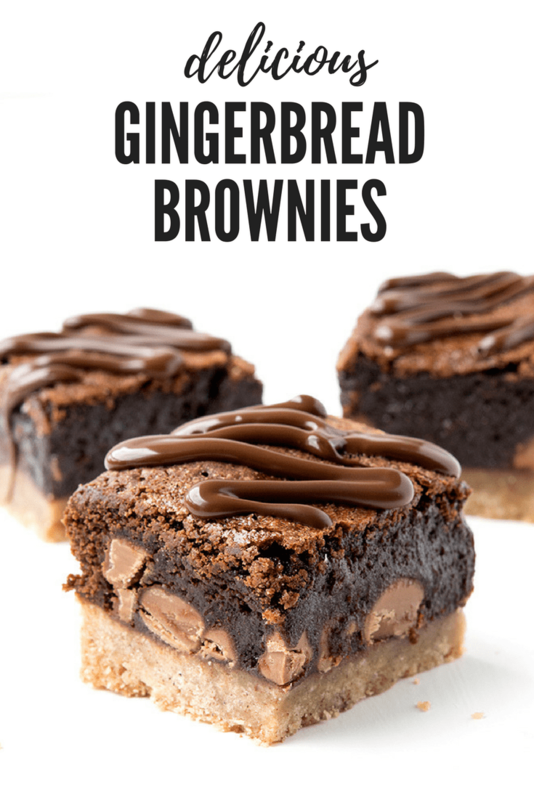 The brownie layer of these Gingerbread Brownies is a spin off of my favourite One Bowl Cocoa Brownies. It’s sweet, fudgy, and oh-so-delish. I added chunks of milk chocolate – can you see them? And a few extra spices like cinnamon and ginger. 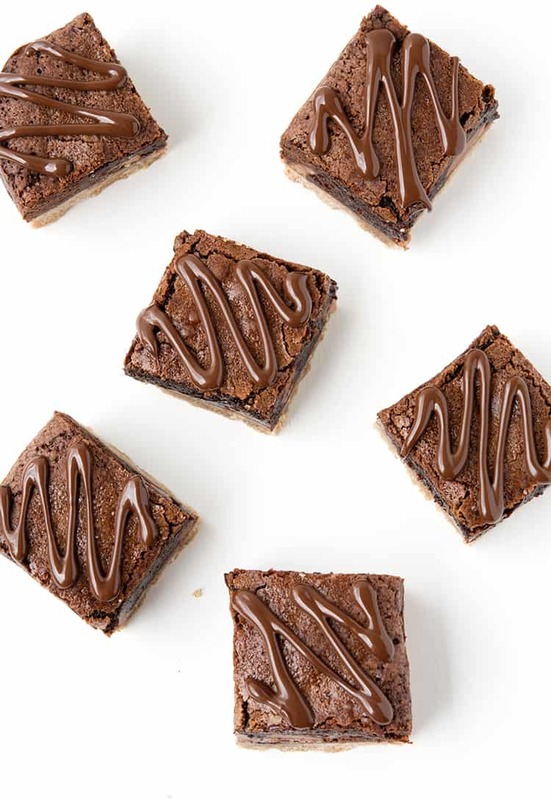 So even the brownies offer a hint of gingerbread cookie flavour – if that’s such a thing. The final touch is a drizzle of dark chocolate and olive oil. I won’t lie, these Gingerbread Chocolate Brownies are fudgy, gooey and completely over-the-top. Which is why we love them! So tell me, have you been doing all the Christmas things? I haven’t started my Christmas shopping yet AND I haven’t put up my Christmas tree. But I did watch Elf the other night. Love that movie! Preheat oven to 180 C (360 F). Grease and line an 8 inch square baking tin with baking or parchment paper, ensuring two sides overhang. In a large mixing bowl, add plain flour, sugar, cinnamon, ginger and butter. Mix together until wet cookie dough forms. Pour into prepared tin and use the back of a spoon to press down gently to form an even layer. In a large mixing bowl, add melted butter and sugars and gently whisk together. Add vanilla extract and stir. Add the eggs, one at a time, stirring in-between, then sift in cocoa powder, flour, cinnamon and ginger. Stir until just combined. Add the chocolate chunks. 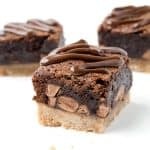 Pour the brownie batter over the cookie crust and place in the oven. 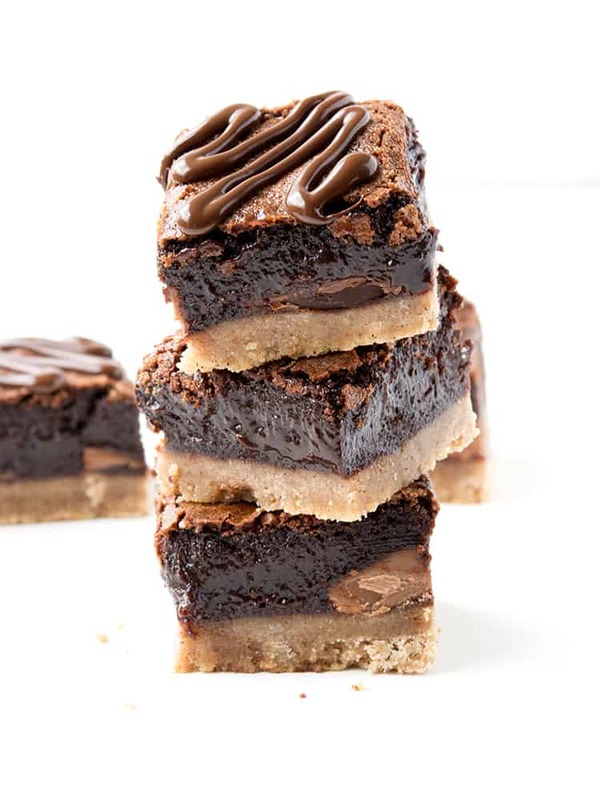 Bake brownies for approximately 40-45 minutes or until they no longer wobble in the middle. Leave in pan to cool completely. To serve, place chocolate and olive oil in a small heatproof bowl and heat in the microwave, stirring every 20 seconds, until melted and smooth. 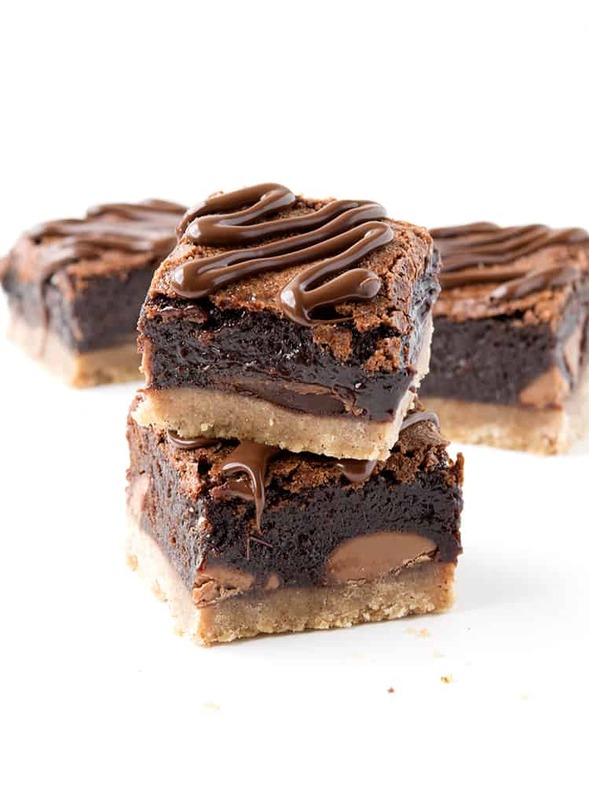 Cut brownies into small squares and drizzle with chocolate. To get your brownies extra gooey like mine, pop them in the fridge for a few hours after they’ve cooled. 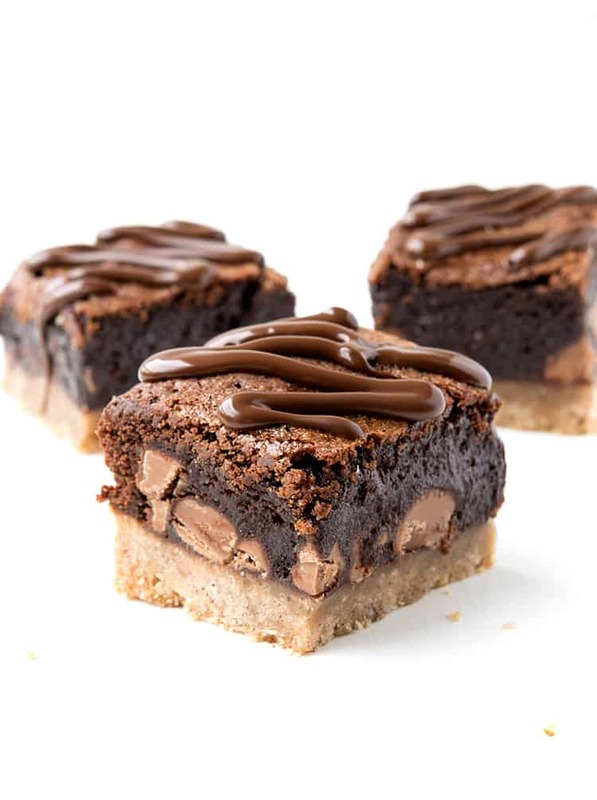 It’s a sure way to get an extra fudgy brownie! I love this Jess! Such an interesting flavour combination but a flavour combination I can definitely get behind. Yum! I love this combination! Sometimes I’m tempted to nibble at the crust first or pick off the toppings, but I think I’d just go for one huge mouthful of everything at once! 🙂 These look delicious!! !